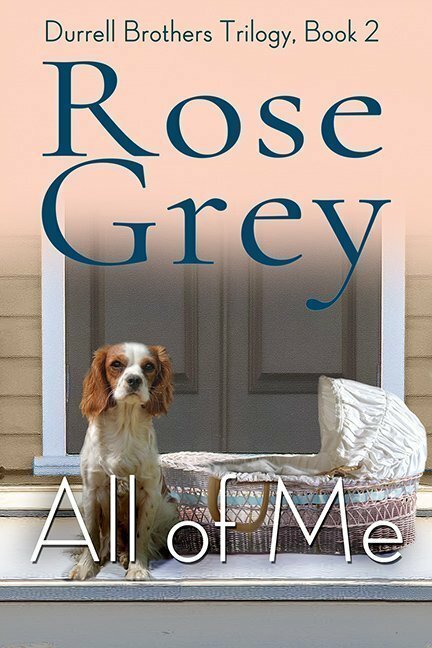 “All of Me” is Rose Grey’s fourth novel and the second in the Durrell Brothers’ Trilogy. The paperback and ibook version can now be purchased directly from Rosegreybooks.com! Two blue eyes. One toothless grin. And Jock Durrell’s heart is gone, gone, gone. Jock is having a lousy week. Learning he is a father has been a shock but it’s the lack of sleep that’s killing him. The kid is five weeks old and cries all night, every night. He needs childcare. Yesterday. He’s hoping for Mary Poppins. Charlotte Aubin is good at getting hired. Staying hired is more of a challenge, especially since she knows nothing about babies. But most worrisome is Jock himself. He’s kind. She hates that in a man – it’s so much more deceitful than open hostility. Falling for the baby may be unavoidable. But falling for Jock would just be stupid. No man can be trusted, especially when it comes to love. But Charlotte’s past follows her, endangering everyone she holds dear. Will she flee to safety? Or risk it all for the man who has stolen her heart?